When a group of Lexingtonians came together in 2001 and founded Town Branch Trail (TBT), they knew two things. First, they were passionate about their idea of a greenway trail connecting Downtown Lexington to area neighborhoods, parks and historic sites. Second, they knew it would be a long - but worthwhile - journey. On Saturday, October 8, 2005 the community was finally able to see the results of their efforts. In fact, they are able to walk, run, bicycle, rollerblade or draw on it! 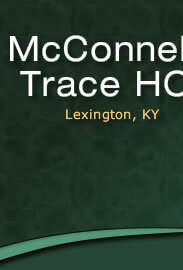 We hope that the McConnell's Trace Neighborhood is as excited as we are about the first section of Town Branch Trail. Our vision is that this will become an amenity beloved by young and old alike, a place for children to play, for mothers to walk their babies, for families to safely bike downtown together, and seniors to enjoy gentle exercise. Town Branch Trail Inc. is a 501(c)(3) corporation whose purpose is to complete a proposed shared-use greenway trail (paved route for pedestrians and bicyclists) connecting Masterson Station and Downtown Lexington, following the westward course of the Town Branch of Elkhorn Creek. The trail will serve those seeking recreation as well as commuters, tourists and businesses, and is a component of Lexington’s newly adopted Greenway Master Plan (http://www.lfucg.com/greenways/masterplan.asp). For additional detail about the trailway, you can visit http://www.townbranch.org for more detail.